I watched Pirates of the Caribbean 4: On Stranger Tides yesterday afternoon, and I can say that it deserves its PG-13 rating. There were definitely a few scenes that would be very intense for young children. There is some irony in one of those very intense and very scary scenes being a setting for one of the cooler LEGO Pirates of the Caribbean sets, but I don’t want to spoil too much. It’s over two hours long, but doesn’t really feel like it. I think it’s going to be one of those movies that people either really like or really don’t care for. It’s not a “reboot” of sorts, but it is meant to be the start of a focus that is squarely on Captain Jack Sparrow and his closest associates. No more Will Turner and Elizabeth Swann, and I actually agree with it. It’s also meant to shift the antagonists away from previous antagonists, while reviving old rivalries. 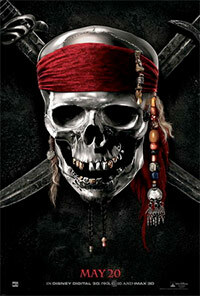 The cast was great – the new additions, including Ian McShane as Blackbeard, were perfect. The settings were perfect as well. The pacing was decent and never felt like they were stuck in one area too long. It definitely has a different feel to it than previous movies, and can be extremely dark in a few areas. Having picked up a few of the PotC LEGO sets, which is the reason for this review, I have to admit that I paid close attention to those scenes in the movie that were the basis for some of the LEGO sets, and I think LEGO did a very good job of capturing those scenes, given the limitations of taking complex action scenes and reducing it to LEGO sets. I have read that they plan on more movies, and the ending definitely set it up for future movies. I also believe that that LEGO would not have replaced their Pirates lineup with Pirates of the Caribbean had there not been a potential for more movies. Yes, as we’ve seen, LEGO has created lines that have revolved around Disney franchises that, so far, will only see one movie in the franchise at the time of those sets releases, with future movies in doubt. I don’t think that’s the case here, both because of what I saw at the end of the movie and because I don’t think LEGO would temporarily replace one of their iconic lines with a movie tie-in for just a year and a single movie. Some are going to point to the Indiana Jones LEGO sets, however the Indiana Jones line wasn’t replacing any of the main LEGO lines/themes. Even if there weren’t any more movies, like Indiana Jones, there is plenty of potential. There are at least 3-4 more ships that could be manufactured, including Juan Ponce de Leon’s ship which would make for a great LEGO set. Again, don’t want to spoil too much, but when you see the scene with his ship, you’ll know what I mean. I also would like to see some Battle Packs created by LEGO, both for British soldiers and sailors, as well as Spanish soldiers and sailors. I really don’t want to spoil too much, but I’ll say that I liked it, but that it’s going to have a mixed reception. Fans of Will Turner and Elizabeth Swann are going to be unhappy while people who felt their arcs were wearing thin will be happy. Little kids = no. The PG-13 rating is well deserved. Seriously, it is very well deserved. Oh and make sure and stay after the ending credits – there is a little video clip that reveals another piece of the puzzle for a 5th and maybe even 6th movie.